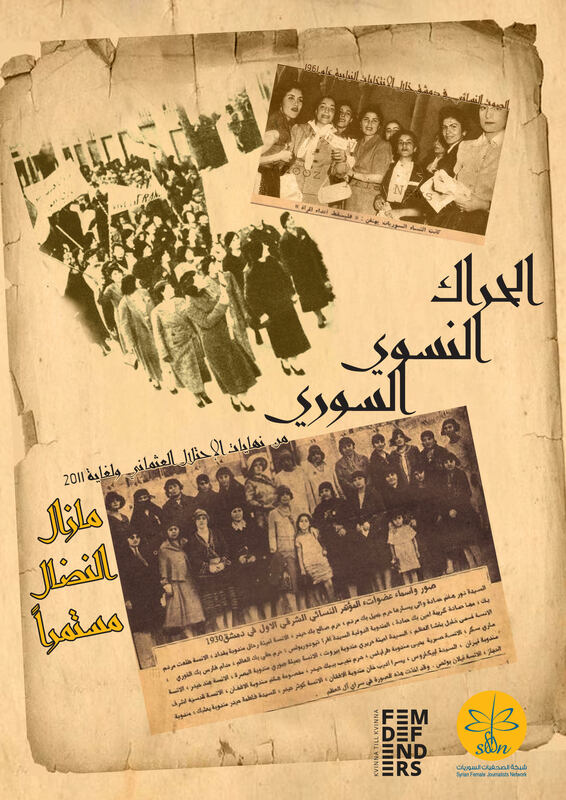 A poster shows historical photos of Syrian women participating in public events in the 20the century. Copyright SFJN 2018. Used with permission. Click for full image. The following piece is the result of a partnership between Global Voices (GV) and the Syrian Female Journalists Network (SJFN). It was written by GV MENA Newsroom editor Joey Ayoub with contributions by GV Italian translator Alice Bonfatti and GV writer Elias Abou Jaoudeh. The Syrian feminist movement started at the end of the 1800s when the lands now known as Syria and Lebanon were under the Ottoman Empire. We got an insight into this rich history through a conversation (in Arabic) between SFJN and Maya Alrahabi, co-founder of the Syrian Women’s Political Movement. It was uploaded on SFJN’s SoundCloud account. It’s no coincidence that the feminist movement started in the late 19th century during the time of Arabic Nahda, or awakening in English, a period of cultural renaissance that began in Egypt and soon spread to Lebanon, Syria and other Arabic-speaking countries. 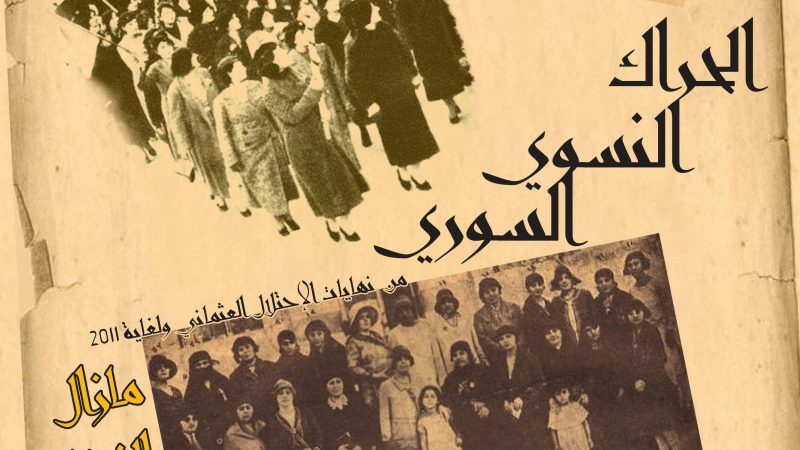 While attention is usually given to such figures as the Egyptian Muslim scholar Rifa’a el-Tahtawi or the Lebanese Maronite scholar Butrus Al-Bustani, Alrahabi emphasizes the role of women in pioneering what would become the Syrian feminist movement. Since the beginning of the movement, Syrian feminists joined the global call for basic rights for women such as the right to vote and education. As we know, the first global feminist wave only talked of a few rights for women: Education, suffrage and the likes. Syrian feminist activists were also demanding those rights at the end of the 19th century. Syrian women gained the right to vote in 1953. Alrahabi recalled women like Marianna Marrach who, as early as 1870, was already writing in newspapers and calling for the liberation of women (and may have been the first Arab woman to do so). She was born in Aleppo and died in Aleppo, living long enough (1848-1919) to see her city pass from the hands of the Ottomans to that of the French. Marrach may have even been the first woman to write in Arabic language newspapers. She revived the tradition of Mujtama’at wa Majaless al-Adabyya Al-Nisa’iya or “women’s literary circles” in her family home in Aleppo, fusing selected European influences with her own Syrian ones. I remember for example Marya Ajami who founded in 1910 the magazine Al-Arous (the bride) and Adila Bayham Al-Jazairi who founded many feminist organisations whose purposes were educational and social as well as advocating for women’s rights, and this coincided with the first global feminist wave. The movement would continue, on and off, until the 1963 Syrian coup d’état, which saw the overthrow of the post-independence republic (1946–1963) and the rise of the Ba’ath party. This was then followed by a second coup which toppled the leaders of the party in 1966 and installed Salah Jadid, followed again by a third coup by Hafez Assad who appointed himself the leader of Syria in 1970. The Assad regime continues to rule Syria to this day since Hafez’s son, Bashar, took over power when the former died in 2000. No other feminist organization has been given a license. And that has been ongoing since 1963. The GUSW was a quasi-governmental organisation whose work was just formal. Its actions amounted to just clapping for and celebrating the ruling party in Syria. It didn’t provide any actual help to women. According to Alrahabi, this monopoly by the state meant that Syrian feminists, as well as most Arab feminists, couldn’t join the global second wave that started in the 1960s. When the second wave of feminism in the world started around the 1960s, we started seeing the understanding of gender and gender roles in society. Here the development of feminism throughout the Arab world stopped due to the control of authoritarian regimes. There were, however, some feminists in the Arab world who spoke of women’s rights from a gender perspective. Alrahabi gave the example of Hanan Nijme, who set up her own cultural salon in 1980 in Damascus. Nijme was instrumental in demanding legal changes to improve the conditions of women and children in Syria and secured some concessions from the state. The following is a brief biography of Nijme (in Arabic). It is with this background in mind that Alrahabi interprets the Syrian revolution since 2011. The 2011 revolution was a revolution against everything, and so the women had a role as revolutionary activists at the forefront of the revolution, and that extended to the important presence of women in organization (of protests, local councils etc). Then Syrian feminist organizations that developed outside of that advocated for women’s rights and merged them into the demands of the revolution. On another level, there were the extremist factions that interacted with women brutally and repressively and tried to send women centuries back. So there were two fronts to fight during the revolution.